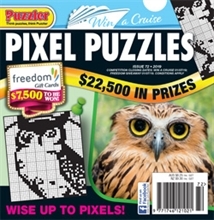 Pixel Puzzles is the magazine where art and logic meet! Pixel Puzzles are an absorbing and rewarding challenge for those with methodical minds. You have both the satisfaction of successfully solving a purely logical puzzle, and the pleasure of seeing a pixelated picture form before your eyes as the squares of a grid are filled in. Deducing the location of shaded squares is prompted by the number clues around the grid, hence the puzzle's description as a form of 'painting by numbers'.